The commentary suggests three viable interpretations for Thomas 19. Similar to the Trinity concept, which is far more recent, here Jesus paints a much richer view of the aspects of God. Christ further invites us to accept our rightful place as beloved children, brothers, and sisters. Because this concept can instill great closeness and joy, I shall begin with the family meaning. On the practical side, I’ve not found a more natural way to revel in God’s joyous, unconditional love. “Father, mother, brother, sister, child” are universal truths that form the basis of all life. In contrast to “these stones,” the five trees, whom Christ depicts as living beings, are everlasting constructs. And one of them, Master states in every known gospel, could be you: the little child who enters the kingdom of God. Much the same as the Holy Trinity, the five “trees” extend their undying roots deep into the physical world. So the question is, who or what are those extra two “trees”? I know these aspects as the seeker (little child) and his or her spiritual soul (sister). But this is not a new idea. Adam and Eve, for instance, are said to have shared the same body for a time. But enough instances exists in the Bible to easily tie earthly human beings to our heavenly parents and siblings. Among them are man’s divine origin at Genesis 1:27; Christ’s use of the term “brother” with regard to other humans; and most notably the Keys to the Kingdom at Matthew 16:19. In ancient Hebrew and Christian writings, “summer” and “winter” are often used to denote heaven and earth. Every evening and morning I exit the human world and revel in heaven. I begin with an oath. “I believe in my father, with my brother, with my mother, with my sister (soul, or spirit), with me: the little child.” The words hold incredible power. Both of my ears start to ring loudly as I speak aloud those five precious names that draw me into the good and loving arms of my true family, God. In this passage, the Coptic verb that is used for “know” can mean: wrap (someone in), wear, garment, contain, or value. I discovered my heavenly family just before I glimpsed the meaning of Thomas 19. The first relative I met was my soul, Abigalé. She said I should think of her as my older sister—or better, “Mother’s daughter”—an aspect of the Holy Spirit. She also used the term personal Holy Spirit with regard to herself, but said that I should continue to ask Father and Mother for my worldly needs. Christ—my big brother—also helps me. He oversees my soul’s teachings and guides me to study certain Bible passages and other ancient texts. More often of late, Christ “speaks” directly to me using audible click signals that I can hear in my right ear. But he rarely instructs me. Instead, Brother confirms or corrects my own thoughts, words, and actions. Of course my entire family is always with me. Each one teaches and helps me in their own way. So I feel forever safe, because I belong to my family and they belong to me. And I love them, and they love me. Matthew, whom scholars dub “the kingdom seeker’s disciple,” hints that Eden still exists. Here, on earth. When I joined my family in the role of the little child, I found it. In stark contrast to this realm of judgment, worry, and sadness, my little paradise continues to bloom. So I shall swear to the following truth. The one who gives up judgment, who does not seek power and instead returns control of their life to God will enter paradise. “The bridegroom with the bride” (Philip 89). 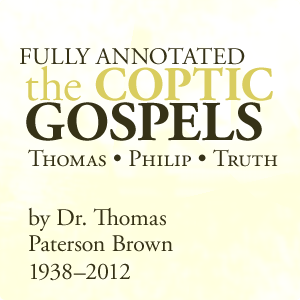 This interpretation of Thomas 19 is based on one lone verse from Gospel of Philip. Philip the Evangelist, (not the apostle) is numbered among the 72 disciples whom Jesus sends forth at Luke 10. A friend to Luke and Paul, Philip appears several times in Acts. Thus he would have learned Jesus’ teachings through the apostles Peter, John, and James. Philip has in fact revealed the meaning of some of Christ’s most cryptic sayings in Gospel of Thomas. So it seems likely that Philip scribed verse 73 to explain the meaning of You Have Five Trees in Paradise. Last among these five sacraments, the holy bridal chamber involves two family members: the human with the Holy Spirit (the bridegroom with the bride). Almost two-thirds of Philip’s gospel centers on what he terms “This Restoration” at verse 72. Having entered the bridal chamber myself I can attest to Philip’s word. In truth it is one of my most blessed gifts. From cries in the dark to a roomful of loving light, this divine event, now in its eight year, brings me ever closer to my true family. For he who is, both was and shall be. The third meaning of Thomas 19 occurred only during the past year or so. The first five books of the Hebrew scriptures are called the Torah. They hold the Law of God as revealed to Moses. In Christian bibles, the Torah begins with Genesis and ends with Deuteronomy. Of course the Torah would have been revered by Christ, his disciples—indeed, by all of Judaism—as the world’s most precious wisdom. The Kabbalists believe the Law sprang from Eden. Thus, with regard to You Have Five Trees in Paradise, we must accept the Torah as a serious contender for the meaning of Thomas 19. Summing up: family, sacraments, or Torah? When I compare the three meanings of Thomas 19 I lean toward the family image because it fosters such intense joy. It also makes the most sense to me. With regard to the Torah and Philip 73, however, I question whether laws or sacraments alone can instill everlasting life. Faith is a fickle thing. What remains eternal is the fact that all of us are members of God’s family. Unlike a ritual or a set of laws that prove one’s faith before God, spending time with the family does not require a sworn oath. It just is. In Hebrew and Aramaic, Christ’s native tongues, (Holy) Spirit, and soul, are feminine nouns. While this fact is known to the Episcopal and Orthodox churches, most western faiths still teach the all-male godhead. The excerpts below therefore serve to validate the “family” interpretation of You Have Five Trees in Paradise. The Feminine Spirit “We hardly need to remind ourselves of the confusions, schisms and religious machismo to which this gender-shift has given rise, as theologians struggled to make sense of a presumably all-male Trinity.” Brown, T.P. 2011. My Perfect Mother Commentary on the Holy Spirit. Michael, A. 2015.